Netivot Rabbinate officials report that bug-free greens sold in the city under the name Birchat David mehadrin does not have the kosher supervision as claimed. Officials are checking if this is a deliberate attempt to defraud the public of a inadvertent glitch. In and event, the bags of the bug-free greens are not approved by the Machon Mitzvoth T’Luyot B’Aretz as claimed. These quick-prepared noodle meals with Russian writing on the package come in various flavors, including meat, chicken and mushroom. They are manufactured in Ukraine and bear the kashrus of the Rabbanut Ukraine, UK, and approval from the Chief Rabbinate. 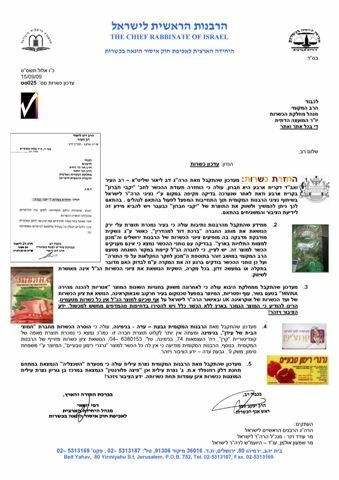 The Rabbinate has not given approval for the product and cannot vouch for its kashrut integrity and stores are instructed to immediately remove it from shelves. (See item 3, left side in original document below). The Shnitzeliya Restaurant located in the Rosenfeld gas station in the Nazareth Industrial Park Gimmel as well as Florentine Pizza, located in Ben-Gurion Center in Nazareth are not under the Nazareth Illit Rabbinate as claimed. Posted on September 21, 2009 by JKN Israel. This entry was posted in 5769 - 2008/2009, Chief Rabbinate Updates. Bookmark the permalink.